The reopening of the Todmorden West curve between Stansfield Hall Junction and Todmorden Viaduct junction occurred on 17 May 2015. The reopening of this chord has restored the triangle at Todmorden; back in the age of steam this was a busy location. Not only were terminating local trains from the Burnley direction reversed in toto, but also excursion trains that started from Todmorden would arrive from Newton Heath and also be reversed from Stansfield Hall to Hall Royd Junctions, before heading back towards Platform 1 at Todmorden Station. Todmorden was also the last location in Great Britain that freight and passenger trains were banked by an steam assisting locomotive from the rear; the last time this operation was performed was on 3 August 1968. The bankers - latterly provided by Rose Grove in Burnley - also performed various trips to local goods yards. One such trip would see the banker set off to collect wagons from Walsden that were then placed in the sidings at Hall Royd waiting to be collected. 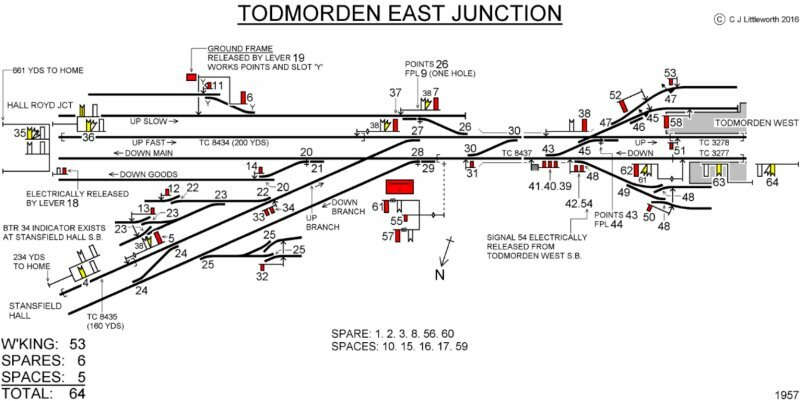 To remind us of the one time complexity of this area Chris Littleworth has kindly provided two of his Signal Box diagrams to mark the reopening of the Todmorden curve on 17 May 2015. 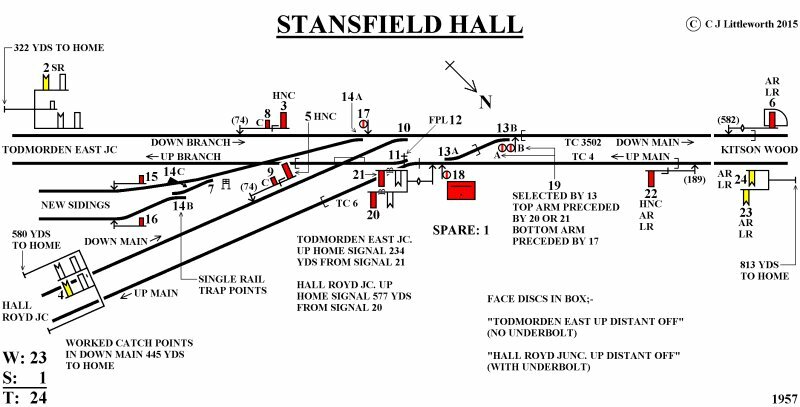 The first shows Stansfield Hall Junction and originally appeared in 'Signal Boxes on Lancashire & Yorkshire Railway Lines - North East Lancashire', published by the Signalling Record Society (ISBN 1 873228 21 X), and is the very last diagram to appear in that particular volume. Companion volumes are 'North and West of Manchester' Parts 1 and 2 published by the Lancashire & Yorkshire Railway Society (ISBN 9 780955 9467 5 2 and 9 780955 9467 6 9), and Chris also contributed to 'The Last Merseyrail Signal Boxes and their heritage Part 1: The Wirral Lines' and 'Part 2 The Northern Line'. It will be apparent from this list that the lines centered on Preston, and those east of Manchester have still to be covered. As a foretaste of things to come, Chris has kindly prepared a diagram for Todmorden East. This reflects the layout in 1964, and Chris believes this shows the changes made when Todmorden West box closed. The distant arms have consequently been removed from the various 'Up' direction home signals, and the line that ran behind Platform 2 through to the west end of the station now forms a siding. However the goods yard on the Up side survives at this time, with access via a ground frame electrically released by lever 47. Click the diagrams to view a larger version. The above diagram contains amendments to the original produced by Chris, as it was unclear how the arrangements in the bay platform and warehouse siding worked. Chris notes (December 2017) that the siding (points & derailer 47 & signal 53) were indeed there, and 52 applied to moves out of both the bay road and the siding, and was inside the fouling point of points 47. He presumes this was done so that trains could use the bay which were longer than the distance between 58 and the buffer stops, even though they would foul moves out of the siding. Chris recently received a notebook containing sketches of Todmorden East and notes: "...the sketch showed a different arrangement for points 22 & 23 and their connections to the Up Branch. I checked this back against some other sketches and have come to the conclusion that this arrangement did not alter to the arrangement previously shown until after (or at the same time as) the closure of West." Fortunately Eric Bentley caught almost the full layout at Todmorden East in this 3 April 1966 view taken at 17.30 hrs with 'Peak' D81 hurrying the Red Bank empty newspaper vans through the Junction. The principal signalling elements have been highlighted (click for a larger image). Photograph Eric Bentley, copyright J K Wallace c. 2015, all rights reserved. A chance trawl through the family scrapbook has thrown up a photograph taken at Ferney Lee Bridge in 1931. The photograph not only shows the side of the bridge which is now obscured by the metal pedestrian footbridge, but also Stansfield Hall Junction's signal 6, which is the advanced starter on the Down Main towards Copy Pit. 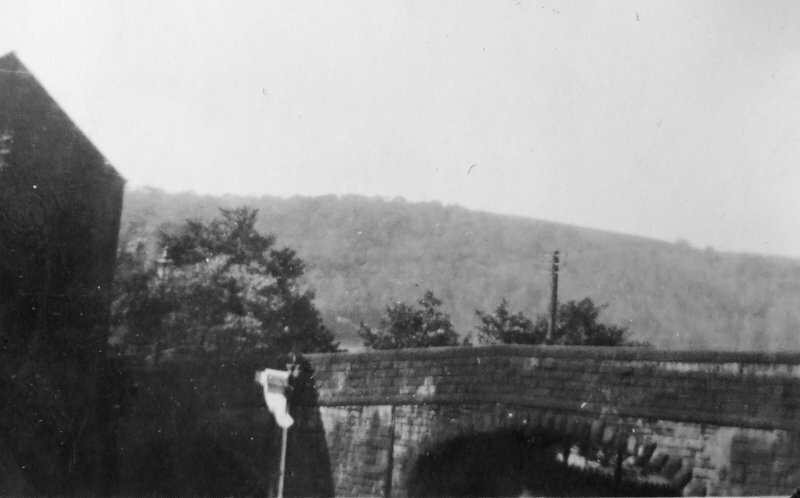 The 1931 photo shows a LYR 1912 signal arm on a wooden post with a white backing board - a feature which is reflected in the 1957 signal box diagram. Note the track circuit diamond. The reason for the photograph is unknown, or the identity of the young man, who appears to be leaping over the wall. To have one photograph of a LYR signal in the family photo album is one thing, but to then find you have two - without any explanation - is even more remarkable!